The green Memory Card Wallet CF10 from LensCoat holds up to ten CF or ten XQD cards. The material is a lightweight, waterproof poly tricot/nylon. The wallet secures with a quiet elastic closure, and is carried by a clip-on tether. All the interior pockets have clear windows so you can easily see which card you need. In addition, a handy business card slot is provided for that quick networking moment. The Memory Card Wallet CF10 is made in the USA. Box Dimensions (LxWxH) 4.7 x 3.9 x 1.8"
Memory Card Wallet CF10 (Green) is rated 4.6 out of 5 by 33. Rated 3 out of 5 by Aaron from A little bulky, but it holds 10 cards This wallet does the job, but the CF cards seem to be a tight fit. It gets kind of bulky as you add more cards. I have 6 CF cards in mine and don't plan to add any more. Rated 5 out of 5 by Happy Customer from Exactly what I was looking for I had searched and bought another one that wasn't at all what I was looking for. This is perfect. It's small, it has a place for my business cards, and I clip it to my camera strap during weddings so I don't have to keep going back to my bag to switch cards. With the clear pockets I know which ones are full and which ones I haven't used (I just turn them over once they are full). I'm buying a couple more to give to some of my photographer friends as gifts. I love it that much! Rated 2 out of 5 by Dominic from Way to big!! This pouch is way to big, can hold way to many cards. I have lots of memory cards and thought this would be the way to go. Then I filled it up with XQD cards and thought what was I thinking. 10 cards in one wallet? It would be like walking around with $ in cash in my wallet. I am not Donald Trump. This is way to much media/money to have in one place. I would recommend two smaller wallets. Rated 4 out of 5 by Reel Contact from Very Practical Fits SD cards with exterior hard plastic case that most SD cards are sold with very nicely. You will have to lose the hard plastic case that comes with the Compact Flash cards in order to fit in this case. It is a soft case so since you can not keep the hard plastic cover that most CF cards have at purchase...I consider that a risk. But great for SD and their exterior plastic cases. Rated 5 out of 5 by Nancy H. from Great way to carry & store SD cards Due to health limitations I will have to get rest during the day while on my upcoming trip to Kenya. That means needing enough memory cards to record 18 days of images. I've had to decide not to take my laptop and spend my time resting between game drives. I'll have a Hugh amount of images to review when I get home but at least on safari I'll be able to keep yo! Rated 5 out of 5 by Radoslaw J. from Will never lose a card again! I lost few cards already and thought I need something to keep them in one place. This products does the trick. All my cards are now stored in one wallet and nowhere else. I can easily move it from bag to bag, it is also easy to mark which card is full (I put those up-side-down). Very nicely sewn, good quality, easy to use, good design. I know this says it's for CF cards. 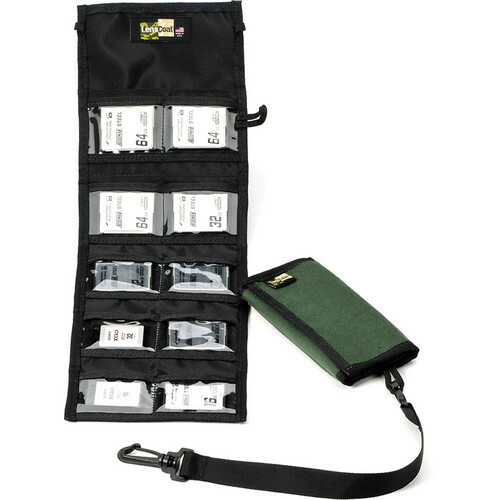 I'm looking for a case that will hold the smaller SD cards in their plastic cases. Do you think the SD case would fit in the pockets of this wallet? Certainly! THis is the reason I got this card case. Just leave/put the cards in their plastic cases and put the cases in the card folder. Can this product hold CFast cards? Not in the plastic cases. Can this item hold CF cards in their plastic cases? Nope, it won't.But it's a nice one, I bought it with another brand that I thought this will be less quality. I ended up using this one, as I find it more handy! !